Ensure that each child receives the physical, emotional, and intellectual support that he or she needs-in school, at home, and in the community-to learn well. Build the capacity of students and parents to be participants, leaders, and decision-makers in their communities. 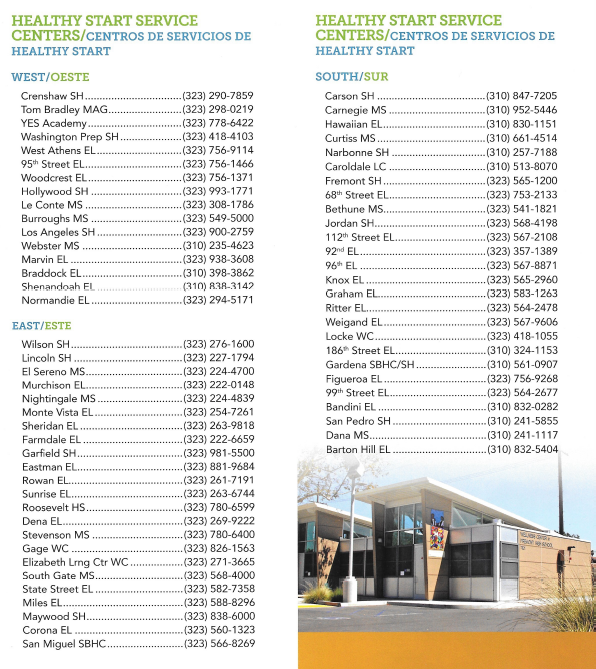 Help schools and other child and family-serving agencies to recognize, streamline and integrate their programs to provide more effective support to children and their families.The California Department of Education (CDE) administers Healthy Start and awards two-year planning, five year operational, and seven-year combined planning and operational grants to local education agencies (LEAs). 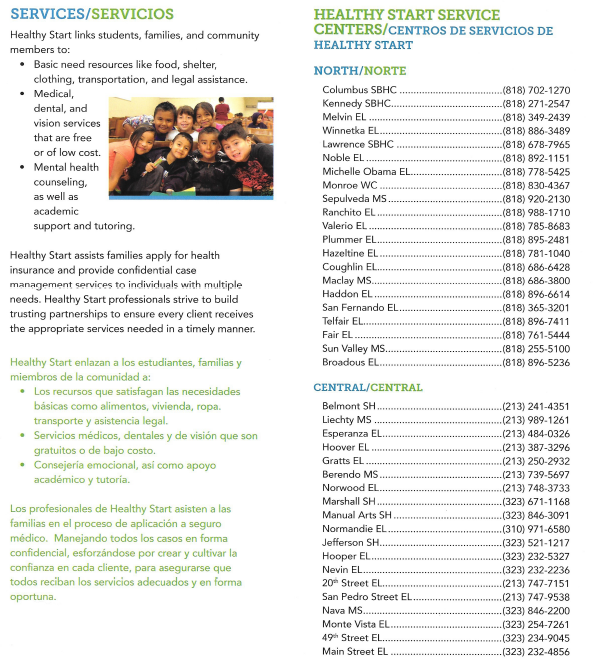 Community Partnerships-Healthy Starts develop community partnerships with public and private partners to deliver coordinated physical and mental health services to children and their families. These services are provided to students at the school site or at other district locations. 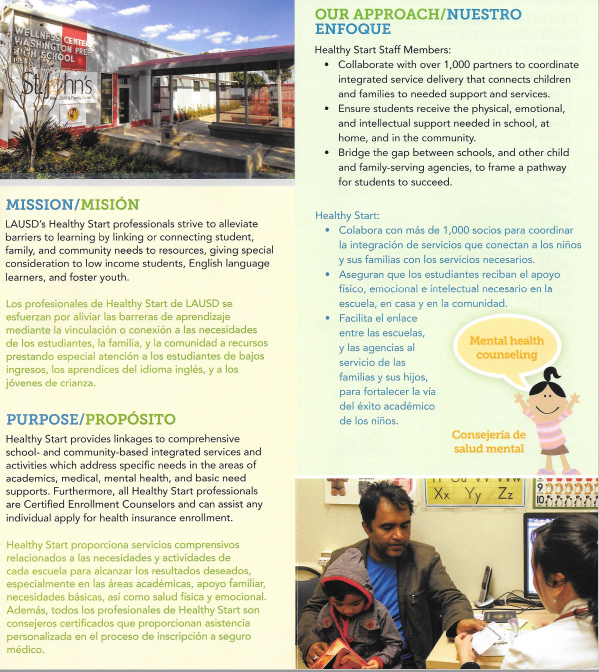 Sustainability-Healthy Start programs leverage dollars to provide comprehensive services to families through in-kind support, and many partner collaborations, and grant dollars. 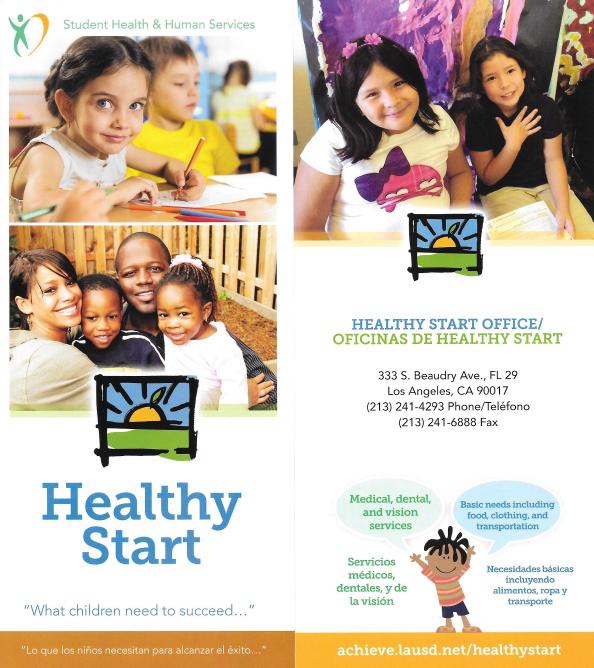 Healthy Start provides LAUSD with 4 dollars for every dollar invested. This dollar leveraging translates to over 21 million dollars annually, at a 4:1 ratio. Strategic Plan-Our goal is to provide all schools with the Healthy Start Collaboration Model of expertise in the development of School-Community Partnerships. Healthy Start Lead persons work with each Educational Service Center's Organization Facilitators to plan, develop, and implement program design.